Sift together the flour, bicarbonate of soda, ginger and cinnamon. Pour into a bowl of a food processor. Add the butter and blend until the mix looks like breadcrumbs. Stir in the sugar. Lightly beat the egg and golden syrup together, add to the food processor and pulse until the mixture clumps together. tip the dough out, kneadbriefly until smooth, wrap in clingfilm and leave to chill in the fridge for 15 minutes. Preheat the over to 180C/350F/Gas 4. Line two baking trays with greaseproof paper. Roll the dough out to a 1/2 cm thickness on a lightly floured surface. Using cutters, cut out the gingerbread men shapes and place on the baking trays, leaving a gap between them. Bake for 12-15 minutes, or until lightly golden brown. Leave on the tray for 10 minutes and then move to a wire rack to finish cooling. 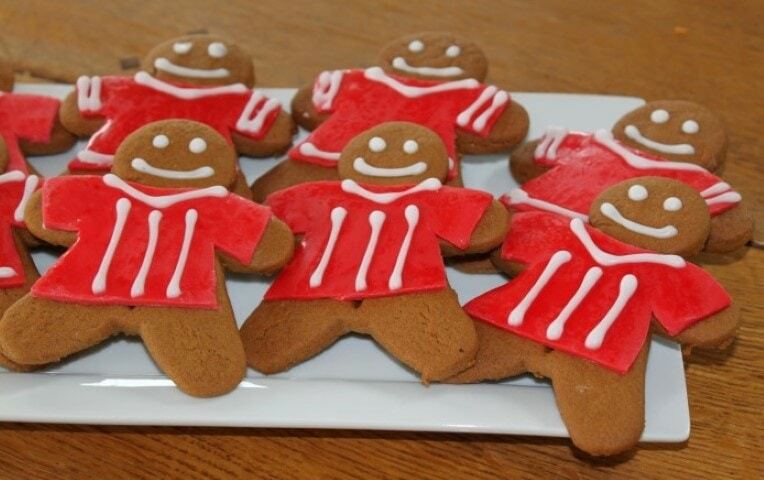 When cool, roll out the royal icing and cut into the shape of a football shirt. These can be either fixed to the gingerbread men if they are hot, or if cool just brush with water. Mix the icing sugar with water to use to pipe details.